We've got a secret. A new obsession. A slight addiction to folding Japanese paper dolls. 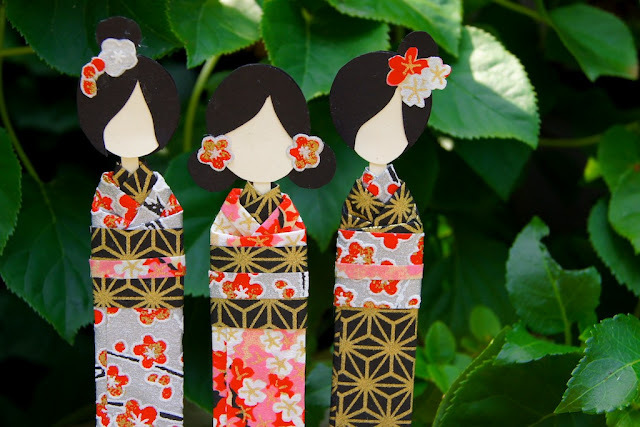 These paper dollies, our take on Japanese shiori ningyo (bookmark dolls), are rather addictive once you get started. 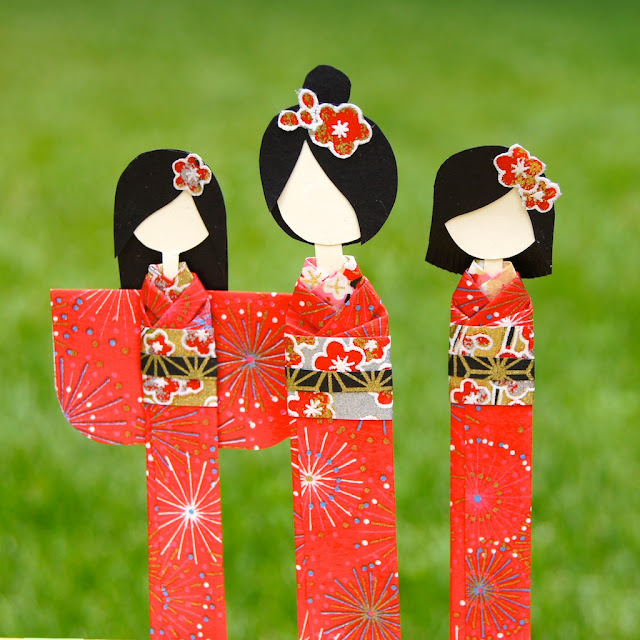 Just some scraps of chiyogami, a few clever folds, a dab or two of glue, and a little bit of fancy scissorwork, and suddenly you've got a bevy of beauties on your hands. 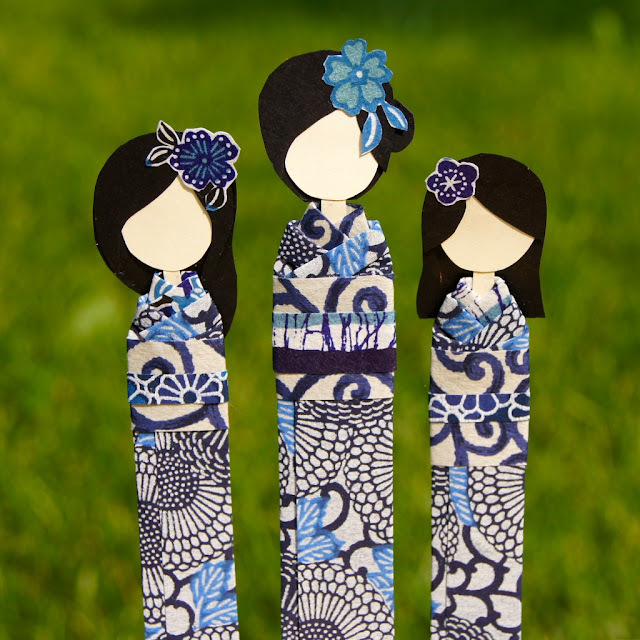 While these paper dolls would make lovely bookmarks, we also envision them on cards, in frames, adorning gifts. 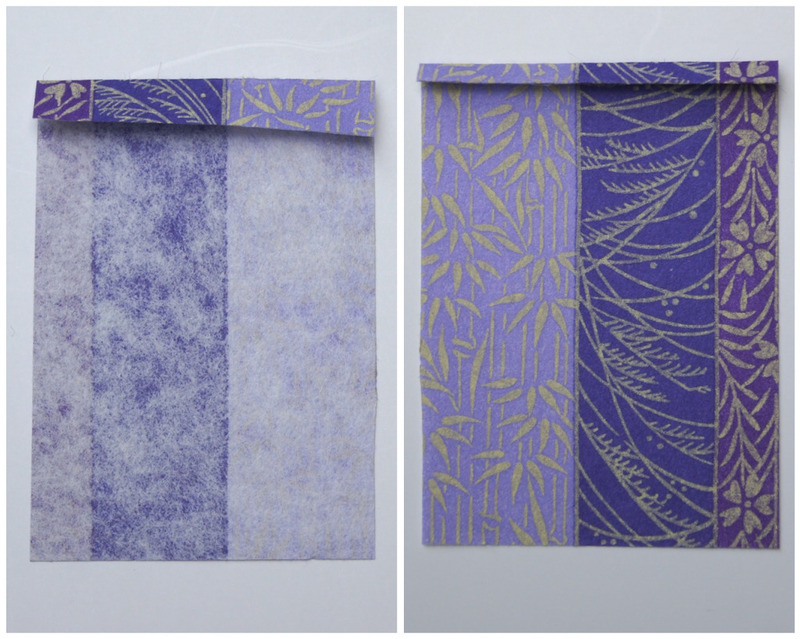 A perfect way to use Omiyage's selection of chiyogami, katazome and aizome! And for you? A little tutorial on how to make 6 lovely little dollies out of little more than 3 pieces of our 5x7" washi papers. 3 dollies with fashionable sleeves. 1. 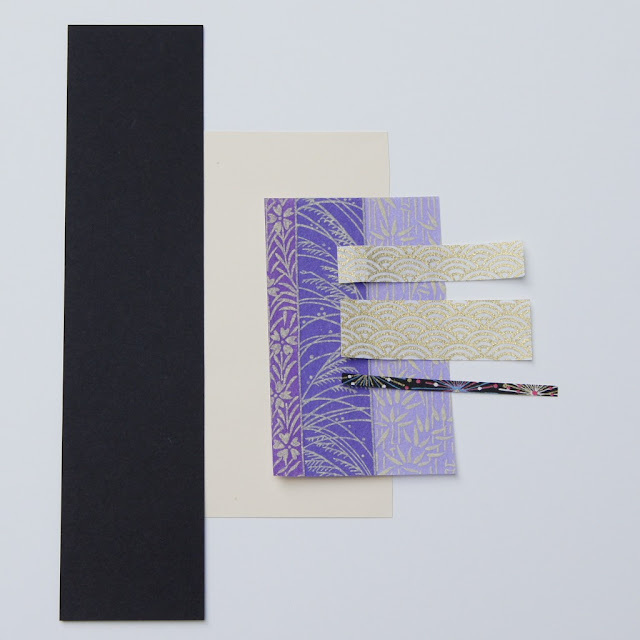 You will need 3 pieces of 5x7" chiyogami paper, white or cream card stock, black card stock, craft glue. We've selected 3 pieces of chiyogami you might find in our 5x7" Washi Variety Pack. 3. 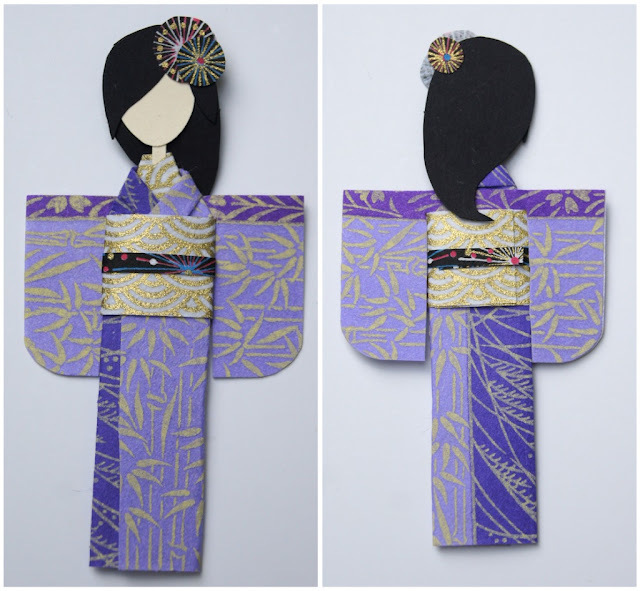 For each doll, gather your selection for kimono/sleeves, collar, obi (wide belt), obijime (belt tie), card stock, scissors and glue. 4. 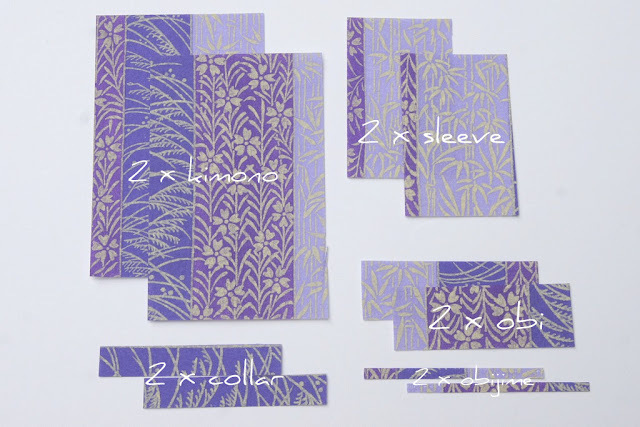 From the cream card stock, cut a long strip for the doll body. Piece should be approximately 1/8" (3mm) wide x 5" (125mm) long. 5. Collar: fold paper for collar in half. Crease well. Wrap around body and fold left side down. Always ensure you fold left side (facing you) first. (The opposite is only ever used for dressing the deceased.) Fold right side down. Secure with glue. Trim excess paper. 6. Kimono: With the paper laying downwards on your working surface, fold down approximately 1/2" (10mm) of narrow edge. Crease well. Turn paper over and fold down approximately 1/4" (5mm) to form kimono collar. Place body with collar in the centre of the kimono fabric. Fold left side of kimono paper over, lining up with collar. Crease only top of the fold. 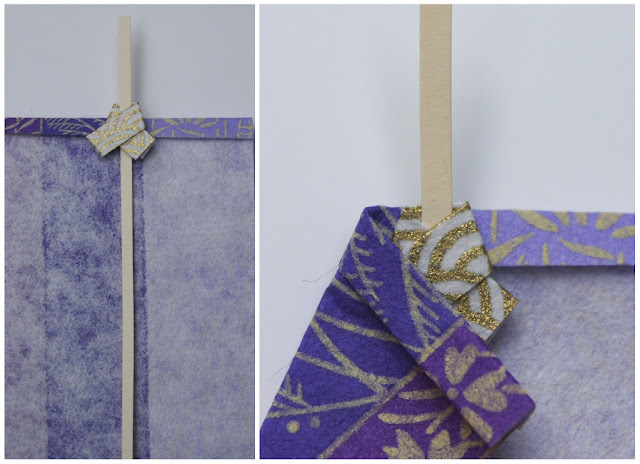 Fold side in to create a straight line from bottom of kimono to newly folded kimono collar, as seen in images below. Repeat with right side. Try to ensure angles are the same. The right side should leave a small strip of the left uncovered as seen below. 7. If not adding sleeves, proceed to step 8. If adding sleeves, glue the sleeve pieces together. 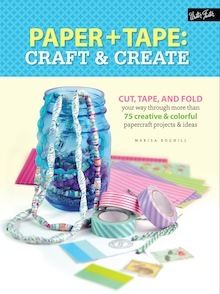 Fold in half and round bottom corner with scissors. 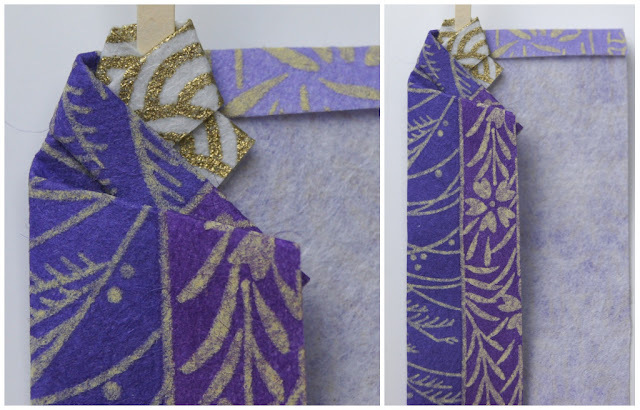 Unfold, hold against back of doll and carefully cut a slit into sleeve paper on either side of the kimono. Cut sleeves into shape shown in middle image below. Glue onto back of kimono just below kimono collar. 8. Wrap obi (wide belt) around doll, covering angled ends of kimono paper. Glue to secure. Trim excess paper. 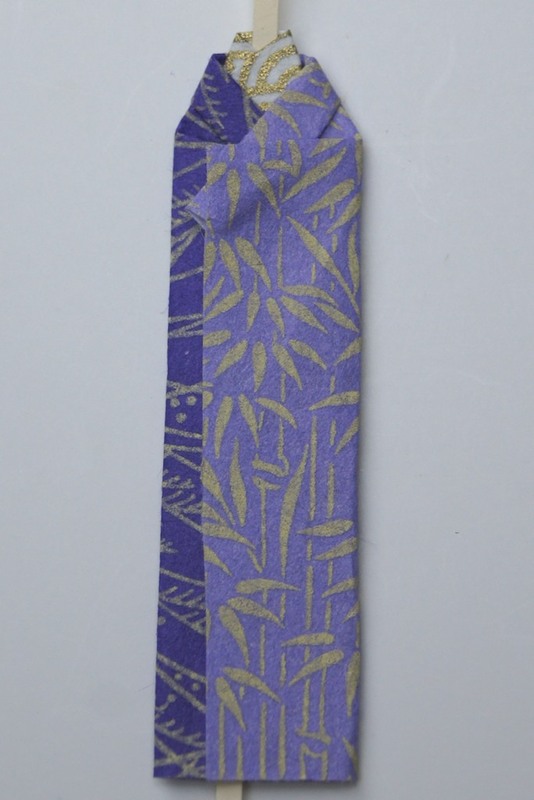 Wrap obijime (belt tie) around obi. Secure with glue. Trim excess paper. 9. Now that the basic form for the doll has been created, it's time to bring your doll to life with a little personality! 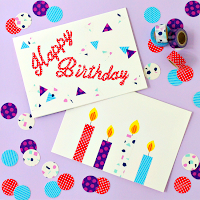 Cut a face from the cream card stock - experiment with round, oval or almond shaped faces for different looks. 10. Attach the face to the black card stock with a small dab of glue - don't glue down completely, you will need to get in between the face and the hair to attach to neck later. Cut around the head to create the back of your hair style. We have found that longer or mid-length, straight hair cuts give your doll a very young look, while creating an updo will give your doll a more sophisticated air. We're into this "swoosh" of hair, for a bit of added interest. 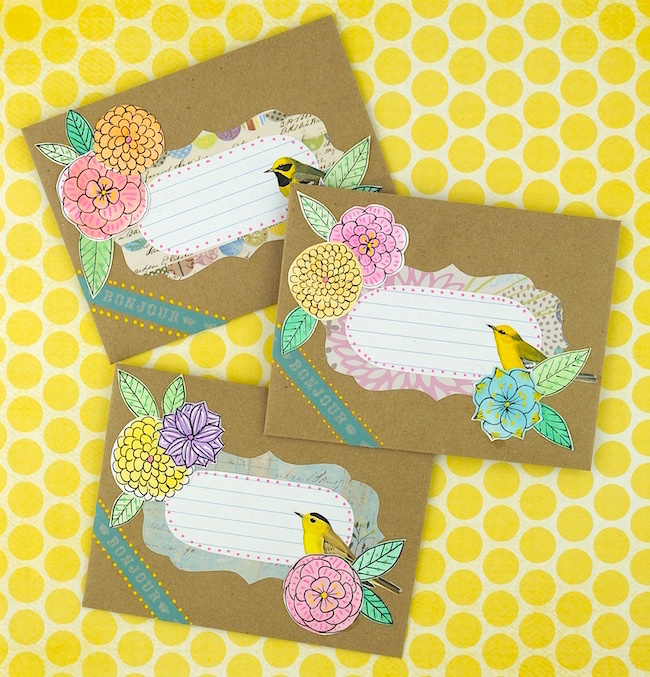 Take a second piece of card stock and use this to create bangs. (Either trace around hair shape and then cut out, or simply hold the second piece of black card to the first and carefully cut into shape to get the top shape of hair - creation of bangs is all up to you!) We've styled our dolls with long sideswept bangs. Ponytails and buns can be sandwiched between the front and back hair pieces. 11. Glue the head to the body by adding glue to the neck and sandwiching between face and back hair piece. If the neck is too long, trim before gluing. Also trim extra body that may be sticking out from bottom of kimono. 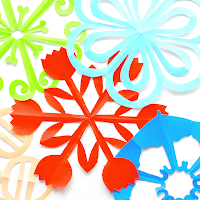 Accessorize with flowers cut from chiyogami scraps for a lovely final touch. There she is - as lovely from the back as she is from the front! We dare you to fold just one! 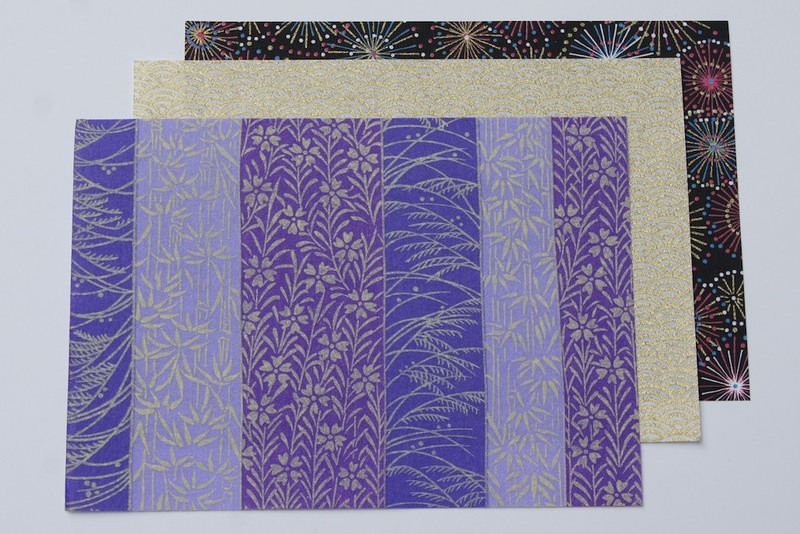 Our 5x7" Washi Paper Packs come in 4 different combinations and can be found in the Crafty section on Omiyage.ca. The hair for Japanese paper dolls is traditionally made from Japanese crepe paper. 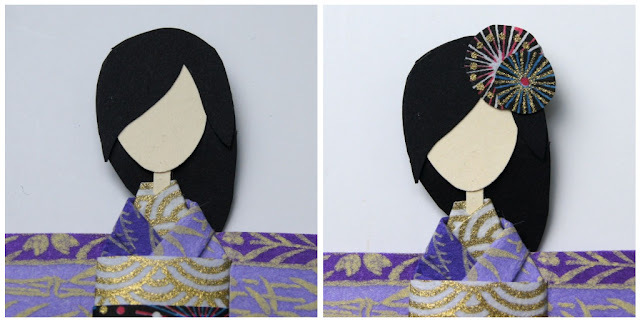 For instructions on how to make this more traditional look, and a tutorial for slightly larger dolls, check out this tutorial on Kimono Reincarnate. 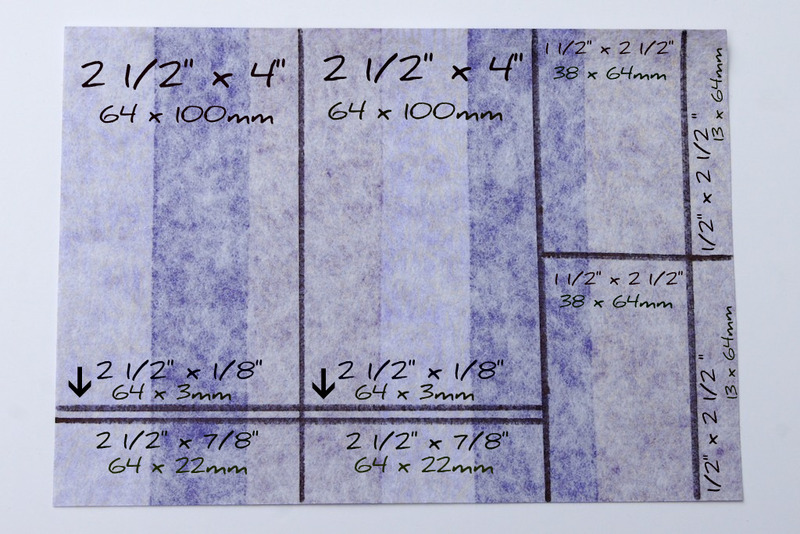 Please note: conversions are approximate and simplified to make measurements easier for both those who think in inches, and those who think more metrically! These are so cute! I Have a thing for Geisha I may have to bookmark these to make when I get home. Thanks for sharing! Wow! These are stunning! I just came across your blog via WhipUp. I would love to link to this if you didn't mind. Thanks gals! And Rachel, we'd love a link. 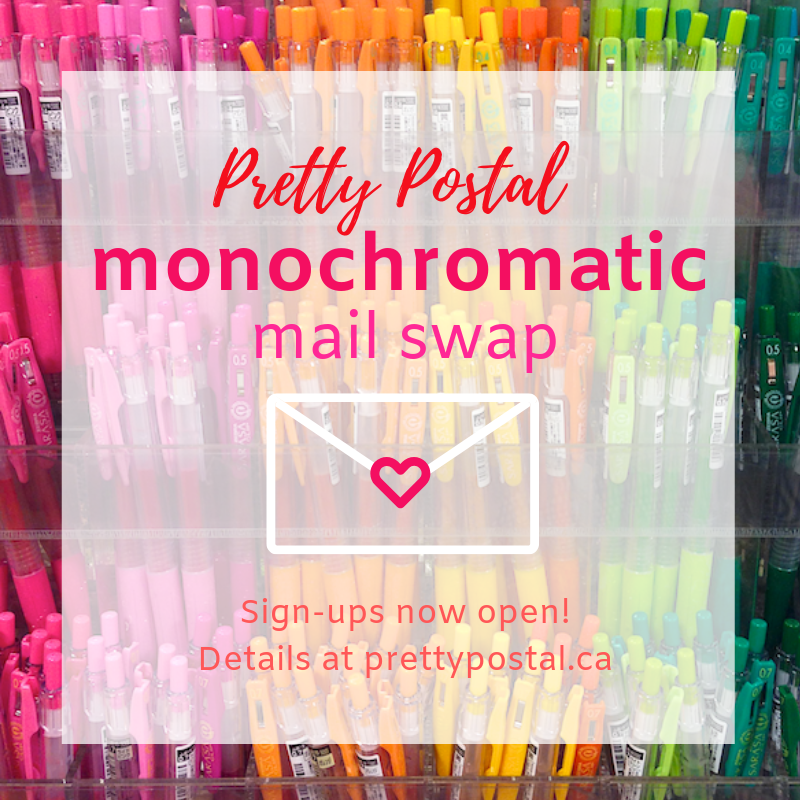 One Pretty Thing is always such a great resource, we'd love to be included! These are so cute. They remind me of gifts I used to get on Girl's Day when I was growing up. Thanks for the tutorial. Love the dolls! You fold them somewhat differently than I do, but they look great! (I'll have to give this method a try sometime). Japanese crepe is awesome, but if you cannot find it around you I also find that regular crepe paper can also be used. You have to be careful because it can be softer, but it makes a nice alternative! I especially love the hairstyles on your dolls <3 From one doll-maker to another, thanks for supporting the craft! I love the way you've done their hair! So much more modern! I'm going to have a play with that! Wonderful, do you know any other tutorials out there, I've been looking for a while now!!! These are the prettiest version I've seen! Love the extra character in the hair/ornaments! Thanks RITI and Amelia! 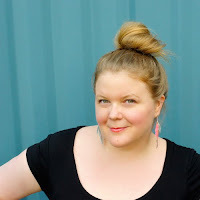 I think the modern hairstyles (vs the traditional crepe paper version) are the secret. Sooo cute! I'm going to have to make some for sure! Thanks so much for sharing the project! Thanks! I have a similar paper doll in my fridge and now I know how to make another. Thanks again!! I made your doll tonite and will be putting it on my blog tomorrow with a shout out about your blog. They are so lovely. I enjoyed making them. I can see why you cant make just one! 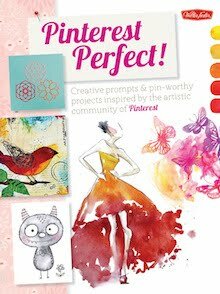 Just a lovely project for any age. 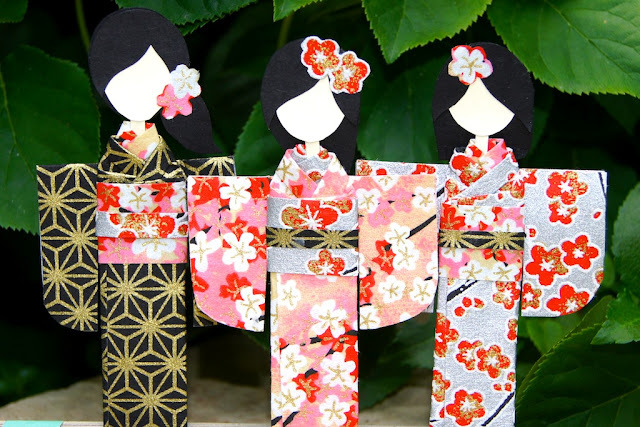 I love Japanese paper dolls. Blessings! Beautifull!!! I love this Japanese paper dolls too! 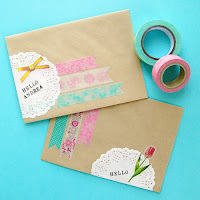 very cute and beutiful, im a Japanese so want to make ones by myself and give my friends as a Japanese Omiyage!! Thank you for sharing! I just made one and your right I HAVE TO MAKE MORE! She is so fun and so cute!! Love this. The Japanese dolly's are the cutest fabric dolls ever. I love how you did their hair. This idea is better than mine, look at this and tell me what do you think, I made it without tutorial, just thinking a japanese book marker, I want to follow your instruction, thanks! I am !! I love it!!! 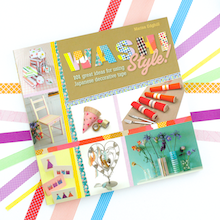 A good idea for scrapbooking and invites! I so love it! 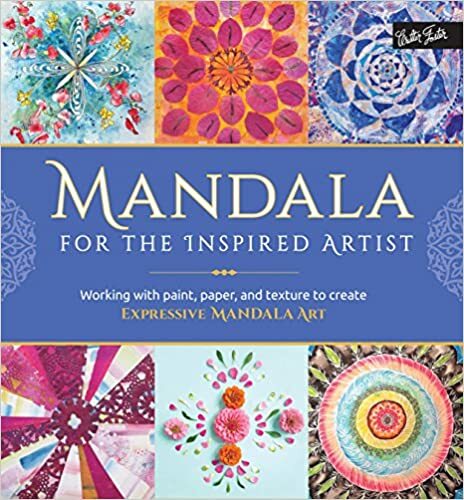 It's my kind of stuff and I can't wait to make one. Thanks for this tutorial. 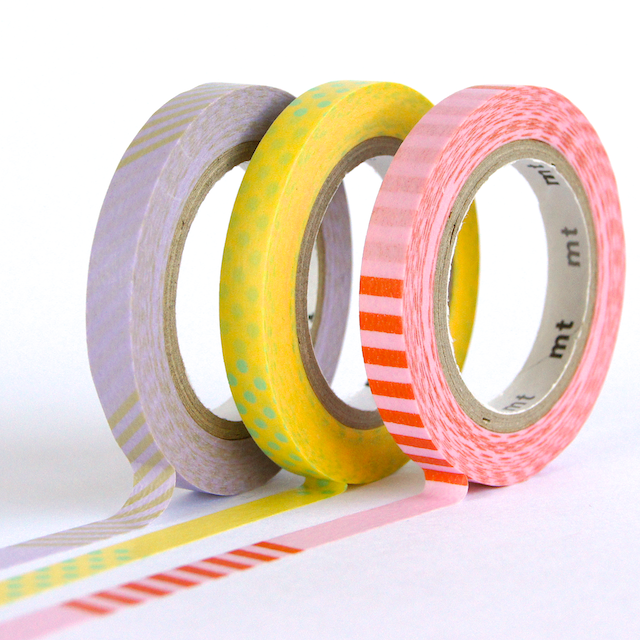 I can't find the Washi Paper section on the Omiyage shop, do you still sell them? Lovely dolls! Thank you so much for the tutorial! Hi Debs, sorry we don't sell the paper at the moment. You can really use any paper though! I love it! They are the pritiest dolls! can u explain me how 2 make tht kimono coz when i fold it it becoms unequal and then how to make it equal?? Hi Angel - I'm not sure what you mean by equal. Do you have a picture? good job! very nice n cute doll... luv it! Well, I just thought I'd see if I could keep this going!!! Just found it on Pintrest and I sure am thrilled!! Great dolls and tutorial. Keep up the good work and if you have stopped it is time to get restarted!! Have a great day.